So, you’ve made the decision to upgrade to an accessible bathroom. What do you do next? How do you choose the right design? What is the ordering process? What other factors do you need to think about? In Canada today the accessible bathing market is exploding. There are a huge range of companies, installers and manufacturers and designs to choose from. So how do you make the process as painless as possible? First, book a free assessment. Orca Healthcare is a family owned company, based in Vancouver and we offer free home and commercial assessments to the Vancouver Lower Mainland , Vancouver Island and Okanagan areas. Next, choose your accessible shower. There are a number of factors that you may want to consider. 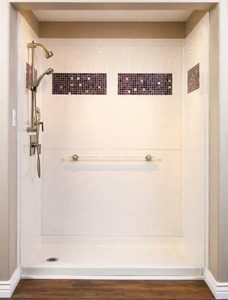 Many of our customers prefer a corner location for their accessible shower, which faces away from other areas of the bathroom. This guards against splashes and sprays. Orca Healthcare accessible showers also have a huge variety of pocket sizes that can be fitted into the existing location of your shower. If you require a wheelchair, you will need the absolute minimum threshold height. If you are concerned about water escaping onto the floor, you may opt for a higher threshold. Orca Healthcare offers a range of threshold heights between 0.5 and 2.25 inches. We also have rubber thresholds available that will collapse under a wheelchair and pop right back up to protect your floor. You don’t want a messy, dangerous bathroom for weeks on end. An important feature to look for is plywood cores and pans with no mud setting required. This means there will be no need to install extra backing on your shower walls and that the base can be easily installed on a leveled floor. We know that you don’t want to make more work for yourself or others. 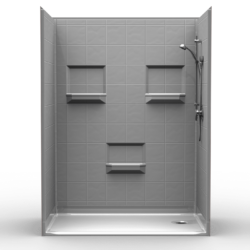 Choose accessible showers with gel coat fiberglass walls. These showers require no scrubbing and the mock grout lines won’t build up with mold or soap scum. The final thing you need to do is choose your accessories. 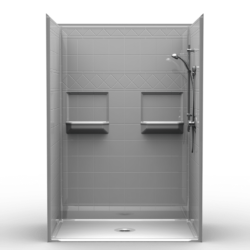 Think about whether you would like a fold up seat, extra grab bars, gliding shower head on a bar or specific shower trim finishes. To book a free assessment, contact ORCA HealthCare today.